Door Tech Industries Provides Commercial Door Services Throughout Greater Vancouver, BC. If you own, operate or manage a commercial facility, warehouse, shipping facility or other type of busy commercial building in Coquitlam you probably have need for a reliable, dependable door and loading dock service contractor. Someone you can call on for all your commercial door and loading dock needs from repairs and maintenance to the expansion of your facilities with new loading docks and door systems. DoorTech Industries is a Vancouver based Commercial Door and Loading Dock company serving customers in Coquitlam. With our centralized location we can have a service truck dispatched to your location the same day you call for any repairs or maintenance service. We’re happy to set appointments if you need a consultation for a new shipping facility or building that would require the installation of new loading dock and door systems. Our experts are very knowledgable on door and loading dock equipment and with over 35 years experience there isn’t an aspect of your commercial doors or loading docks that we cannot provide you with expert advice on. 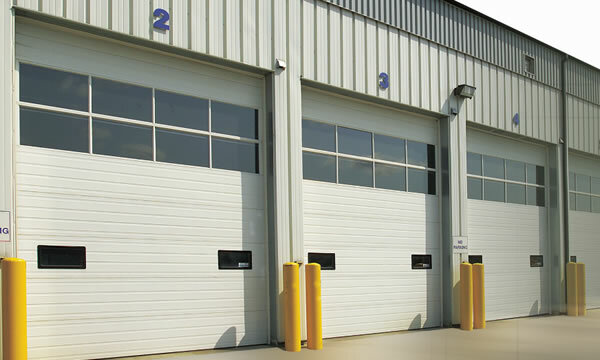 If you have large overhead, rolling steel, or high speed doors at your Coquitlam business location then DoorTech Industries can provide you with fast,efficient repair services in the event of an emergency. Our fully equipped service trucks are equipped with the most common door parts that we are often called to replace and all the tools our technicians will need. Our licensed and insured technicians will be able to quickly diagnose the problem with your door system, repair it and get your business back and operational again. If you are building a new facility, or upgrading the door systems on an existing building DoorTech also sells and installs rolling steel doors, rolling window and counter shutters, sectional overhead doors and high speed door systems. Busy loading docks are often in need of repair and replacement parts such as dock seals and pvc strip curtains. With trucks and trailers coming and going all day, freight being loaded and unloaded, your loading dock systems will get abused, misused and eventually need repair. DoorTech Industries is a full service loading dock company providing everything from dock leveler installations and repairs, truck restraint system installation and repair, loading dock accessories, and skilled loading dock maintenance. If you need services for your Coquitlam loading dock then DoorTech Industries can send one of our fully equipped loading dock service trucks to your building immediately. If there is one area where every commercial building owner could probably improve their operation efficiency it’s with a professional door and loading dock maintenance program. When you have the need for commercial door repairs, or loading dock repairs it means your business isn’t moving and it was probably something that could have been prevented. When your loading docks aren’t safe, or functional they are costing you money and could cost you even more in liabilities should an accident occur due to lack of maintenance. DoorTech Industries provides comprehensive commercial door and loading dock maintenance programs for Coquitlam commercial and industrial buildings. We can inspect and service your door systems, dock levelers and truck restraints along with your dock seals and other “wearable” parts in your loading dock facility. Our trained technicians can create a custom tailored maintenance program for your building where we’ll service and inspect your doors and loading docks on a timed schedule that works best for you. We keep detailed written service records in case you ever need them and no work will be performed unless agreed upon, beforehand. Why Should You Choose DoorTech Industries? We understand that you have many different options for commercial door repair and loading dock services in Coquitlam. When you choose DoorTech Industries you’re supporting a locally owned and operated family business. There is a pretty good chance one of our own sons (there are four that work in the business) will arrive at your location to service your door or loading dock. We aren’t the largest company to offer similar services and we’re certainly not the smallest but one thing is is certain. DoorTech Industries will always put your business needs first. When you call us, we’ll be there day or night to offer you the expert service Coquitlam area business owners have come to expect from our 35 years of service. If it’s an emergency and you need repair services right away then give us a call, 24 hours a day. If it’s a little less urgent, feel free to call during regular business hours or fill out one of our online contact forms and we’ll get back in touch with you promptly. We look forward to serving you. What Is Your Specific Commercial Door or Loading Dock Question? Our trained technicians are very knowledgeable about CFIA requirements with respect to environmental issues for doors and ramps and can help you meet commercial food storage and shipping requirements. DoorTech Industries are licensed dealers for Westgate and Northwest Doors. We sell, install and service Westgate door systems. DoorTech Industries are authorized Steel-Craft dealers and we provide service, repairs and new installations of all Steel-Craft products. DoorTech Industries are dealers for Albany Door Systems and we sell, install and service door solutions by Albany. Nordock, Kelley, Pacific, Pentalift, Dynaco, Albany, Steel-Craft and more.